One of our absolute most favorite franchises is Jurassic Park and all of the follow up movies. It is just one of those series that can keep making movies and we will ALWAYS go see them. 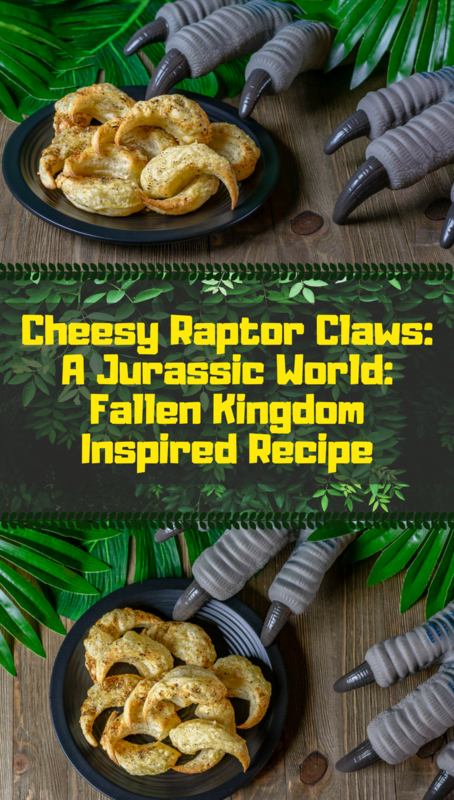 We really enjoyed Jurassic World and when we heard it was getting a sequel we couldn’t wait to sink our teeth into creating a recipe for it. 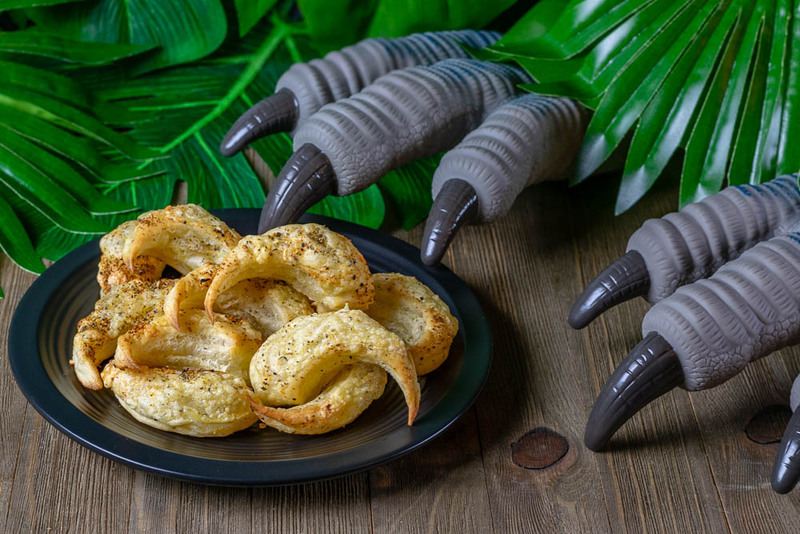 We’ve come up with a recipe for Cheesy Raptor Claws, inspired by our favorite dinosaur, the velociraptor! 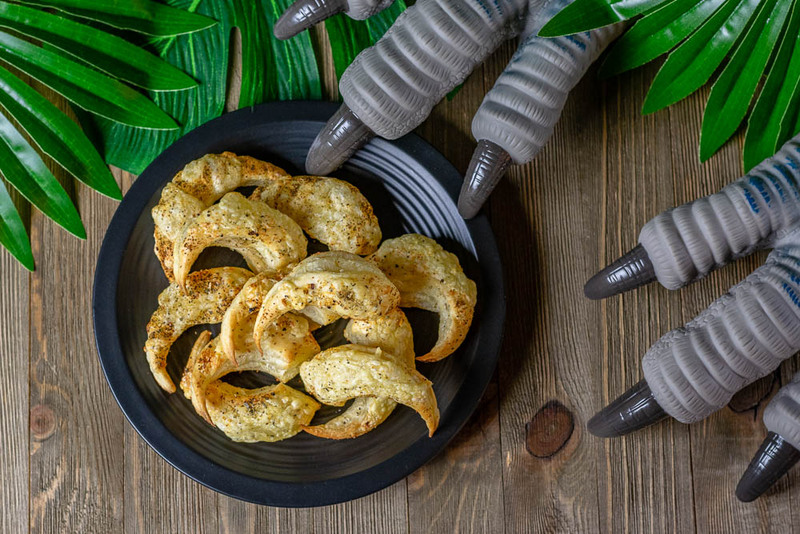 As huge fans of the Jurassic Park series we really wanted to create a recipe that carried a theme of all the movies. We were reminded of the first film, where Dr. Alan Grant carried around a raptor claw. Raptors have been so integal We went through a couple iterations of claw recipes and settled on a cheesy version. We’ve done enough desserts lately. That being said, switch the cheese and seasoning for powdered sugar and chocolate syrup and BAM, easy dessert! In addition to our tasty Cheesy Velociraptor Claws recipe, we are giving away 2 pairs of VIP advanced screening passes for a sneak preview of Jurassic World: Fallen Kingdom. The screening will be on Tuesday, June 19th at 7 pm at Harkins Arizona Mills IMAX. Winners should arrive at 6:15 in order to guarantee their seating. Winners will be selected on Sunday, June 17th. Good luck! On a floured surface, roll out your puff pastry. Place claws on parchment lined baking sheet. Top claw with pinch of cheese and a sprinkle of seasoning. Bake for about 7 minutes or until golden.